Sometimes I think my legs have a mind of their own. They want to run. So they do. That's what happened at Mess The Dress on Saturday. This race is one of my all time favorites. 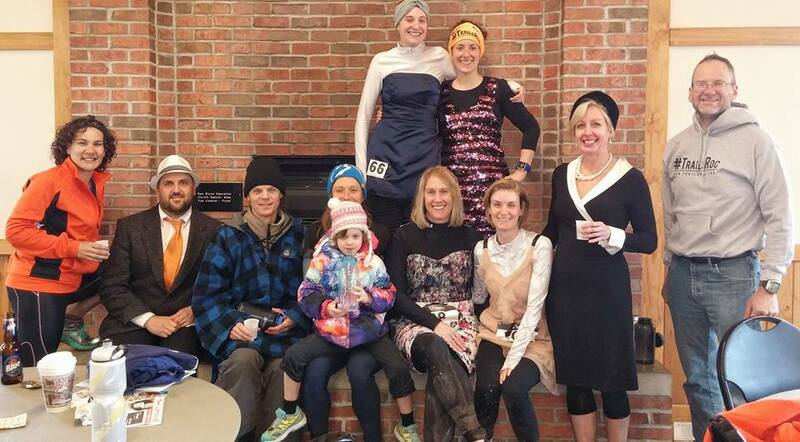 What's not to love about an event that combines trail running and fancy dresses? Except, the night before the race Pete called me and when I saw his face, I started to cry. He said the hardest part of his deployment was not the long hours or being yelled at, it was being away from me, knowing that it was causing me pain. And that made me cry even more. I said I didn't want to run Mess The Dress without him. For the past two years, we've finished this race hand in hand. The prospect of doing it without him was just too sad. Pete asked me what time the race started and said he could run with me via FaceTime. Unfortunately, he had to do more firing-guns-at-things training on Saturday and the race didn't start until 10am, which was too late for him to join me. But the fact that he would offer to do that made me smile. Laura picked me up Saturday morning and we arrived at Black Creek Park under cloudy skies and swirling snowflakes. It was cold enough that we had to wear tights and long sleeve shirts under our dresses, which kind of harshed our glam. But the lodge was warm and there were plenty of awesome outfits to admire. Laura, Jenn, Rob and I did a one mile warm up then headed to the start line. I didn't really feel like running, or more specifically, running in the cold. I am weary of wearing so many layers. I was finding it hard to muster any enthusiasm for the race, even though I love it. But I guess my legs had other plans. I went out faster than I usually do and I just kept up the pace. It was one of those lucky days when everything goes well and running feels effortless. The miles flew by quickly. There was mud, but it wasn't bad. There were piles of rocks to jump over. The sun came out and it was a beautiful day in the woods. I caught up to Prem, chatted with him for a bit, then he told me to go on ahead. 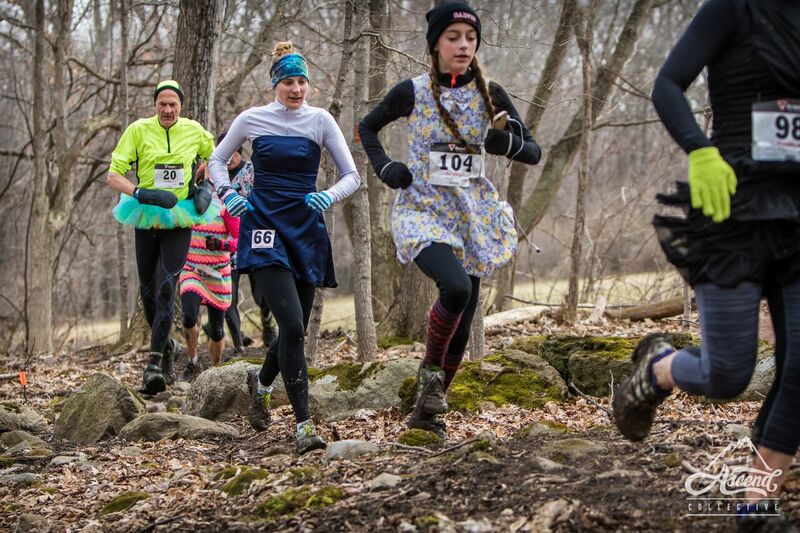 I splashed through some more mud and soon I was running uphill to the finish line. When Eric called out my name, I realized it was my first time running this race as Jen Lacey, and when I saw my finishing time, I realized it was also my fastest time on this course. Apparently, if you want to get faster, just change your last name. At the finish line, Valerie gave me some insanely amazing hot chocolate, which totally made up for the fact that it was still hot chocolate weather in April. I didn't feel sad anymore, I didn't even feel tired. There's nothing like a TrailsRoc event to make any day dirtier and more fun (special thanks to Sheila for having all the best ideas). 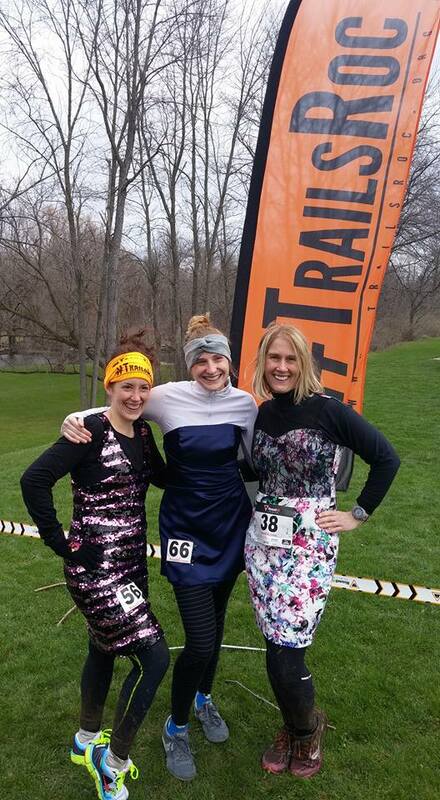 Another fabulous day of trails and dresses! I don't remember thinking about much of anything during this race. I was just in it, lost in the immediacy of the moment. I do remember marveling at how running always seems to give me exactly what I need. That day, what it gave me was the feeling that whatever happens, be it mud, sadness, the second coming of winter, it is bearable, and even beautiful. And a feeling of gratitude, for having legs that love to run and a heart that is so full of love for all these people and these hijinks. Lyric of the moment: "We are always running for the thrill of it. Always pushing up the hill, searching for the thrill of it. On and on and on we are calling out and out again. Never looking down I'm just in awe of what's in front of me..." ~Empire Of The Sun "Walking On A Dream"